The van rumbles to a stop, and you get out onto the deserted sandy road. You hear the crashing of the surf in the darkness. Behind you, the other members of your group exit the transporte colectivo. There is excited chatter from the kids. The guide leads the small group of eight into the pitch-black interior of the beach shack. There, using only a dim reddish light, he tells you all about the turtles. It is a little after 8 PM and you have just taken a rough taxi ride across Isla Colon to Bluff Beach, to see the sea turtles. For a few short months, both the hawksbill and leatherback species lay their eggs on the beaches of Panamá. The eggs laid in April are also hatching this month. However, the guide does not guarantee that you will see anything at all. He sends out two guys, also from the Turtle Conservancy, to run ahead, and signal with a red flashlight if they find any turtles. At last, you all step out onto the beach, and start walking. You quickly draw ahead of the others. It is very dark, with no moon and no artificial light. The only illumination comes from the stars overhead. In front of you, the big dipper is low on the horizon, reminding you of escaped slaves on the underground railroad, following the drinking gourd to freedom. The sand is damp and uneven beneath your feet. When you step down, tiny flashes of green appear between your toes. You’ve never seen bioluminescence in the sand before. On your left is the jungle, dark and brooding, alive with the sounds of frogs, insects, and other creatures. Occasionally, a light from a house or passing car stabs out through the trees, before being swallowed by the dense foliage. On your right is the ocean. The black lumps of eight-foot swells break and crash in a never-ending thunderous cacophony. The white foam appears luminous in the starlight as it rushes to swallow your feet. There is a very dreamlike quality to the night. You feel as if you could walk on forever, impervious to fatigue. All sense of time and distance are lost. The Milky Way arches above, like a thin band of clouds. Behind you, dimly heard, the rest of the group chatters away. A small child runs on her short legs to catch up with you. She walks with you for a while, and asks, “How many stars are there?” “Billions,” you answer. “OK,” she says, and runs back to her friends, no doubt to resolve some trivial dispute. You are disappointed that she can’t appreciate the contemplation of the universe in silence. You have been walking for maybe an hour when the guide spots the red signal lights of the runners. They have found something. You all hurry to see what they have found. It is a leatherback turtle, digging a nest in the sand. She is by far the largest turtle you have ever seen, with a shell over five feet long. Careful to stay out of her field of view, you all kneel in the damp sand behind her to watch as she uses her back flippers to scoop the sand from her three-foot-deep hole. Presently, she stops digging. One of the runners produces a plastic bag, and places it in the hole. The guide explains that the turtle chose a bad place for her nest, and that the eggs will not hatch if they are laid in the water in the bottom. They will be reburied in a dry hole to increase the chances of survival. A few minutes later, the first white baseball-sized egg rolls into the bag. You all sit enthralled, as if in front of a movie, as the huge turtle lays about a hundred eggs. Then, the first runner reaches into the hole, and deftly pulls the bulging bag back out without disrupting the mother, who begins the laborious task of filling the hole, completely unaware that it is empty. The guide checks his watch, and says that it’s time to go. You stand up, sweep the sand from your clothes, and start the long walk back to the taxi. You have witnessed something rare and almost magical: a leatherback, probably the last of the season, laying her eggs on a starlit beach. Yesterday we witnessed a natural phenomenon that had us scratching our heads and mildly worried. Zillions of insects with helicopter-like wings rose up out of the jungle after a heavy rain into the calm evening air. After a brief-but-frantic flight, they landed, dropped their wings and disappeared. Most of them landed ashore, some of them landed on the surface of the water or the docks, and a few hundred landed on our boat. This morning, we went looking for the survivors, but all we found were hundreds of black wings. What were they? If you guessed termites, you would be correct. There are two common types of termites: subterranean and dry-wood or “powderpost.” The West Indian Powderpost might infest a wooden boat, boring into the wood, making a nest inside it, and slowly eating away at and weakening it. The subterranean variety, after the nuptial flight, dig a hole in the ground, mate, and lay eggs, creating a nest underground and mud-tunnels up to wooden structures. So which ones did we find on Take Two? Turns out the easiest way to differentiate one type from the other is by looking at the wings. Using our microscope and a very helpful University of Florida website, I was able to identify exactly which species left wings all over the cockpit and decks of our boat. Thankfully, they were the subterranean variety, having taken flight from their jungle homes on Isla Bastimentos, looking for deadwood in the rain forest, not cedar, mahogany, teak, or cold-molded marine plywood, all of which are part of Take Two’s construction. One mystery remains, though: where did all the termites go? We dug around in some cockpit lockers and failed to find a single bug. Add that to the other mysterious visitors we’ve had on Take Two recently, like the fruit bat that nibbled bananas in our fruit bowl in the middle of the night, or the little brown beetles we picked up in Colombia that attracted our new “pet” geckos. Despite our living in a floating home, we get a surprising number of critters aboard, not all of them welcome. That’s right, folks, that wee little strip of land connecting good ole’ North and South America. Home of the Panama Canal, Manuel Noriega, and Chiquita Bananas. We’ve been living in the expat republic for several months now, and it’s pretty good. Panama seems like your typical Central American third-world country. The jungle is green, the sun is hot, and the rain is wet. 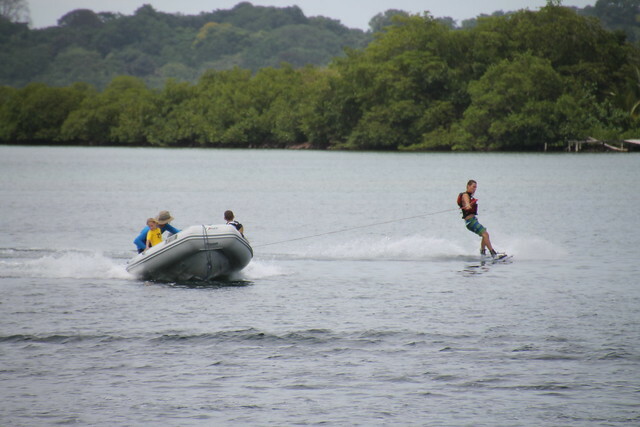 Take Two is situated at Red Frog Beach Resort and Marina, on Isla Bastimentos. 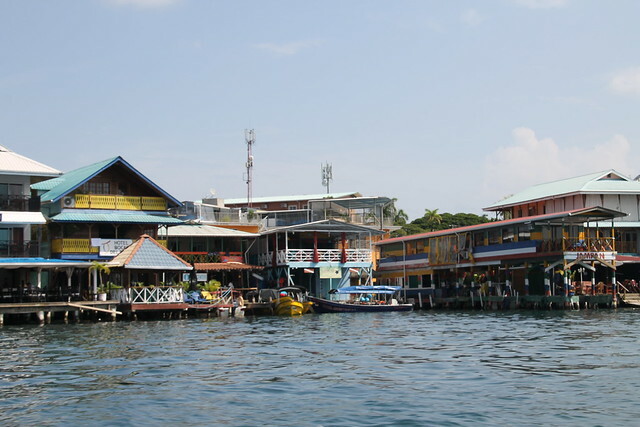 Bocas Town, the primary settlement, lies on Isla Colon, another large island a few miles to the north. Aesthetically speaking, Bocas del Toro is a cool place. The islands are very different from the low limestone Cays in the Bahamas, or the rocky desert of Bonaire. They are rolling and hilly, rimmed with mangroves and covered with lush green jungle. Dotting the coasts of the islands are indigenous villages and gringo houses. The sides facing the Caribbean Sea have beautiful white-sand beaches lined with coconut palms. There are five basic types of people in Bocas. First, you have the Panameños, the Spanish-speaking Panamanians, that live in Bocas town and the surrounding area. Then there are the indigenous peoples. They live in small villages spread around the islands, paddle around in dugout cayucos, fish, and sell coconuts. There are also many people of African descent, as well as Chinese people. And last, but certainly not least, there are the gringos, the white people not born in Latin America. This category can be further sorted into to two sub-categories, with a few exceptions. 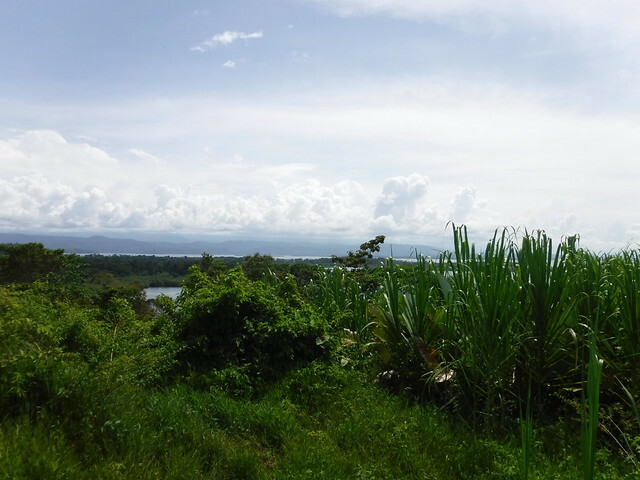 In the first are the expat retirees, people generally over 50, who spend all or some of the year in Bocas. In the second, you have the backpackers, young singles or couples that migrate through Central and South America in an unending river with nothing but their flip-flops and the contents of their ever-present backpacks. The preferred mode of transport for the non-indigenous people is the panga. A panga is a medium-sized fiberglass fishing/work boat, with a fabric sun-shade and oversize outboard. They are used by Panameños and gringos alike, and most of them seem to be in a perpetual state of disrepair. The closest equivalent land vehicle is the minibus. Since we arrived at Red Frog, we have made a few friends. The most notable is the family that owns Agua Dulce, the other marina on Isla Bastimentos. In addition to running a marina, they house volunteers, do panga and boat repair, and run a small medical clinic for the indigenous people. 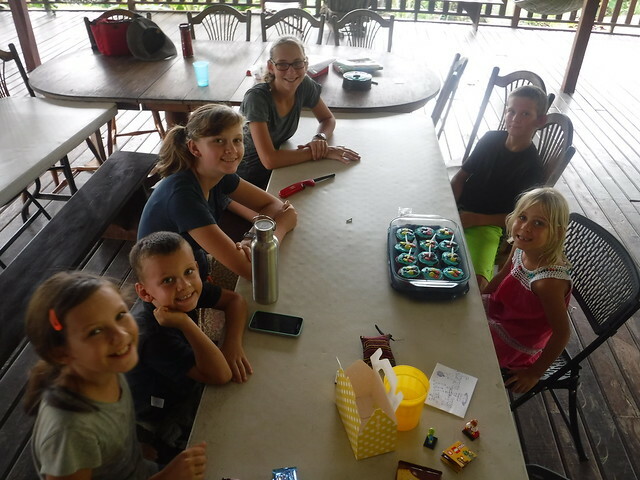 They have three kids who are home-schooled, fluent in Spanish, and reasonably good at ping-pong. 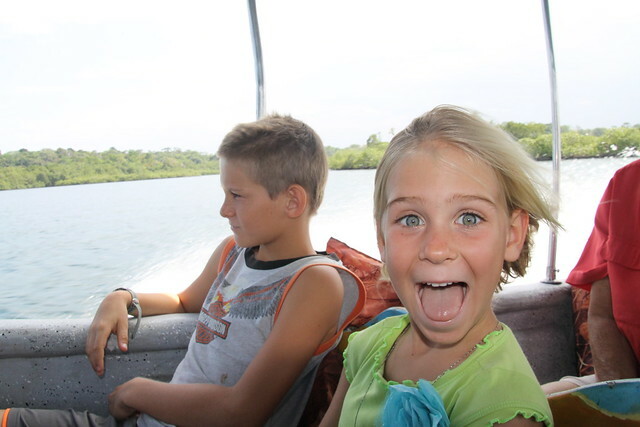 Every Tuesday, Mom and one lucky volunteer catch the free marina water taxi to Bocas town for groceries and packages. This involves hauling the Red Wagon all over town, in and out of five or six separate stores of varying degrees of cleanliness, and somehow dragging a weeks’ worth of food back to the taxi dock before one o’clock. The main duty of the lucky volunteer is to assist in the portage of the goods. He or she is also usually rewarded with a special treat of some kind. The weekly grocery haul sometimes lasts us less than a week, so further resupply excursions to the small marina store may be required. On many weekends, we take the boat out of the marina and spend a night or two at anchor. This is the first place we have been able to do this easily. There are innumerable mangrove islands and coral reefs to explore in Bocas, and very few other boats, so it feels like we have the place to ourselves. We spend the weekend swimming, climbing the rigging, wake-boarding, and just generally remembering what it feels like to cruise on a sailboat. The water is pretty clear around here, but the snorkeling is not so great. There are a few good spots that we know about, but most of the coral is patchy and not very interesting. Of course, we are a bit spoiled in that department; compared to the Bahamas, the Virgin Islands, or Bonaire, poor Panama just is not that impressive. One thing it seems to have in abundance is lion-fish. One time while we were anchored out, Sam, Dad, and I speared over eight of the nasty little buggers in one afternoon. Unfortunately, they were too small to be worth the effort of filleting. 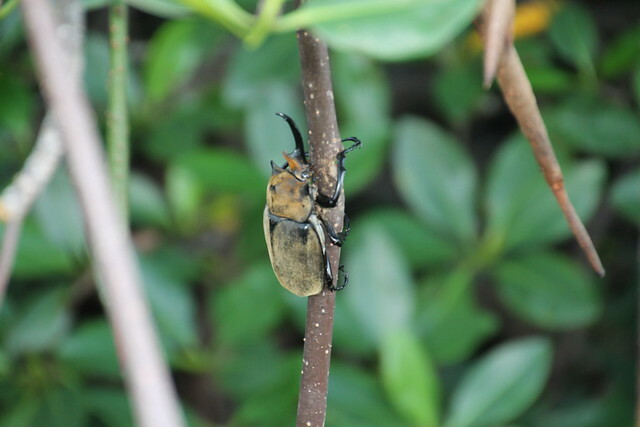 All the insects are extremely numerous and virile, from the army ants that will carry you off, too the Hercules beetles that will knock you over. The chitras, the local brand of biting no-see-um, are particularly irritating… or they would be, if we didn’t run the AC all night (and all day, as we are doing disturbingly more and more often). Mosquitos are less of a problem then we had originally anticipated, although rainy season has yet to start. I am very glad of this fact, given the quantity of readily available parasites just waiting for the opportunity to infect and permanently maim you (go Google Leishmaniasis or botfly to see what I mean). Aside from a trip to the interior to see the mountains and cloud forests, we have not done a lot of overland travel while we’ve been here. Our proximity to Costa Rica and the Pacific Coast of Central America makes those tempting destinations for future family outings. We’d also like to cruise back toward the islands of San Blas, and to central Panama to see the Panama Canal. For now, since Panama is south of the hurricane belt, we’ve decided to stick around and enjoy what this place has to offer.